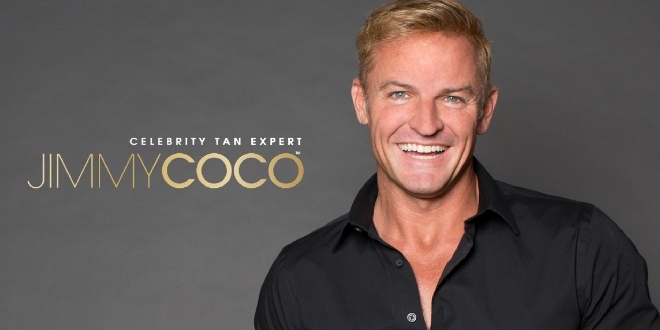 MineTan Taps Jimmy Coco, Spray Tanner To The Stars, As Brand Ambassador | [All Things Tanning] For Tan Fans! MineTan Press Release August 2017. MineTan Body Skin, the breakthrough line of professional and at-home tanning products from Australia designed to expertly complement any skin tone, has brought its first Brand Ambassador on board – Jimmy Coco, the most in-demand tanner in Hollywood. During Jimmy’s 10-plus years as Hollywood’s most sought-after skin finishing and tanning expert, Jimmy has worked with some of the biggest A-listers in the business, including Heidi Klum, Ariana Grande, Jennifer Garner, Gigi Hadid, Victoria Beckham, the Kardashian sisters and has been behind the most glowing looks of the Victoria’s Secret Fashion show 10 years in a row. He’s won 12 awards, including Allure’s Best in Beauty – an honor he’s received four times – and has been featured in countless magazines and TV shows such as InStyle, Cosmopolitan, Elle, GQ, Vogue, Good Morning America and Access Hollywood. A pioneer of the spray tanning movement, Jimmy’s been dubbed the world’s first celebrity tanner and a spray tanning guru by media and stars alike. He’s thrilled to be working with MineTan and says that he’s already seen an impressive increase in repeat clientele since he started using the brand’s products. “Overall, I am enjoying amazing results,” Jimmy says. Formulated with Fast Tanning Actives and Quad Bronzing Technology, MineTan is the only tanning brand that offers custom skin finish and lasting tan in just 1 hour across all its products. All products are infused with powerful antioxidants and amino acids to help tans develop faster, and create a beautiful glow or a dazzling dark tan that lasts. You choose how dark you want to go by deciding when you want to shower. The leading self tanning brand in Australia, MineTan has seen an extraordinary response since its recent launch in the U.S., selling out during each of its two QVC spots and garnering waitlists of more than 1,400 eager shoppers with its Coconut Coffee Self Tan Foam, one of many of MineTan’s world’s first products. MineTan has also been nominated for three QVC Consumer Choice Awards in the following categories; Best Beauty Device: Body, Best Self Tanner, and Rising Star. All MineTan formulas contain PETA-approved ingredients that benefit skin, including botanicals like argan oil, coffee, coconut oil, and shea butter. Every product in the line is vegan friendly, contains 100% natural DHA, and free of parabens.